Nothing like old love to remind you of who you have been, and who you have become. So I just picked up my favorite novel for yet another re-reading. At 17, when Mr. Hansen assigned All the King’s Men for my Honors English class, it was love at first sight. The first-person narrator, Jack Burden, ranks among American literature’s finest, in the company of such inimitable voices as Huck Finn, Holden Caulfield, and Nick Carraway. The book was put in my hands, and love budded like first apple blossom, and my life changed. I mean it. I opened to the first page of Robert Penn Warren’s prose, and I knew I wanted to be a writer. I had always been a writer, since I first held a pencil. Scrawling stories plagiarized from picture books. But this was different. It was a hunger, and I would rather spend my life feeding that flame and watch it come to nothing–than to distance myself from the hunger, which felt like life itself. I read the novel again around the age of 23. And by then, the love had hardened into green fruit. I face a dilemma. At 17, I swallowed Jack Burden’s condescending sexism along with my vitamins. It is much harder to swallow now. At 17, I remember being vaguely disappointed in Lucy. As if I had hoped for a comrade and hadn’t got one. I was devoutly Mormon, but I knew even then I could never be the good little housewife. And Lucy disappointed me. Because her self-fulfillment came from setting a good table. As if she were too stupid to understand the political forces that swept through her house and her husband. As if these, too, were not part of her existence. As if political wives swell with no ambitions for their husbands. Then there is Sadie Burke, drawn to be the devil to Lucy’s angel. But Warren makes such an effort to masculinize her, and he has such trouble holding in mind both her intellect and her womanhood, that I am equally disappointed. I love Sadie. But I always feel like she’s being misrepresented, out of proportion, mangled. Something about the perspective is all wrong, as if he has foreshortened her portrait. 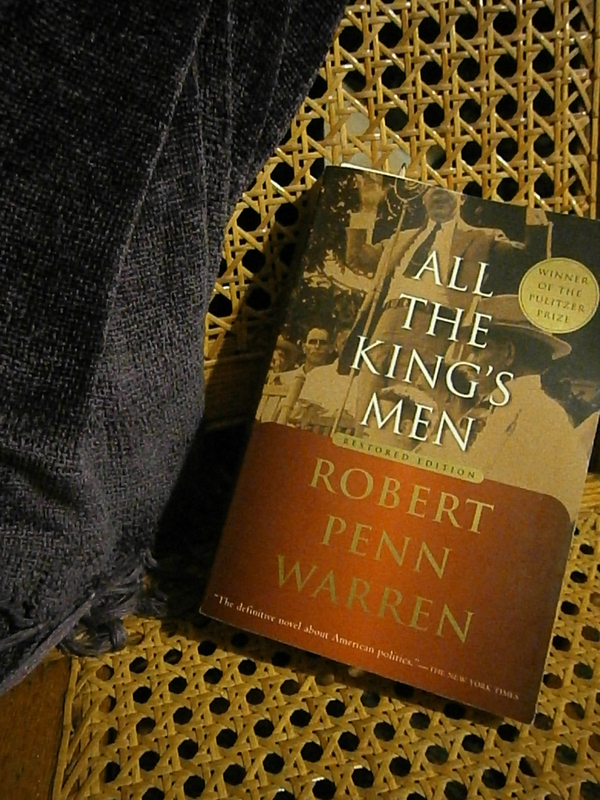 As a feminist, I want to ask more of Robert Penn Warren. Because this is not just a narrator with some perspective problems. This is simply Warren’s view of women, and it pervades his work. But is it the job of a white man writing in the 1930s and 1940s to reflect back to me something I can recognize as myself? Is it? Many writers say in interviews that they began writing fiction because they could not find stories that spoke to them. There were no books about their experience. And so they started writing what they wanted to read but could not find. Perhaps this was the hunger Warren opened inside me, at 17. Perhaps it was the dual fact that his prose is poetry–that I saw what writers could do with sentences–at the same moment I saw that I was nowhere in literature. The young white woman wrestling with impossible questions of god and ethics and self-worth and privilege, who felt penned in by her community but so desperately wanted love from them, too–I could not find this girl anywhere. Plenty of stories about boys wrestling with dangerous and difficult ideas. None about girls. Who wrestle with fire itself. But it is too much to ask of Warren. It is not too much to ask of Shakespeare or of Henry James. But it proves too much for Warren. Yet I can’t hold it against him. I can’t love the novel any less for its antiquated, sexist portrayals of women. Does this make me a bad feminist? Quite possibly. But I love this novel too much to be sad about that. And this is precisely the power and the pleasure–and the terrible moral risk–of great literature. Next Next post: How Do You Find Your Courage?